This modern development of bungalow apartments and townhouses is located in the popular area of Torre de la Horadada and is only 300 meters to the sea. This complex is built to the highest of standards with a beautiful communal area with swimming pools, gardens and a children’s playground. These lovely apartments have two bedrooms and two bathrooms, one of which is en-suite to the master bedroom. The ground floor apartments have a large front terrace and rear patio, and the top floor apartments have a solarium. All properties are built with high quality materials and finished to an excellent standard. Features included in these apartments are: a security armoured front door, double glazing, exterior light fittings, fitted wardrobes in the bedrooms, under floor heating in the bathrooms, motorized blinds in the living room, pre-installation for air conditioning, and a fitted kitchen which is equipped with a ceramic hob, extractor, oven, fridge, dishwasher, microwave and washing machine. This project is located close to all amenities in the desirable area of Torre de la Horadada, and only a 5 minutes’ walk to the town centre, beaches, marina and promenade. It is a 10 minute drive to the golf courses of Campoamor, Villamartin and Las Ramblas and 45 minutes to La Manga golf course. Well connected by the road network, Murcia airport is 15 minutes away and Alicante airport is 45 minutes away. 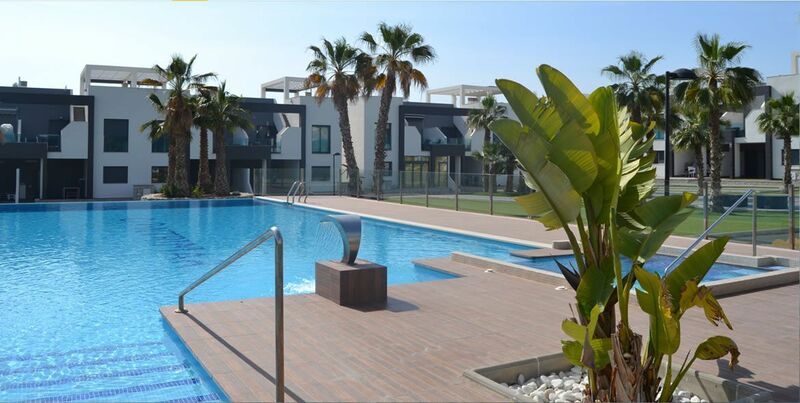 This development of modern bungalow apartments is fantastically located in the popular Torre de la Horadada. There is a large communal pool and garden with a Jacuzzi and shower. Situated just a short stroll to the main village plaza, some great beaches and a small marina with a lovely promenade. Only 250 metres from the beach these lovely apartments have three bedrooms and two bathrooms, one of which is en-suite to the master bedroom, the ground floor apartments have a large terrace and the top floor apartments have a solarium. They all face onto the communal area. These excellent properties are constructed using quality materials and are highly rated in energy efficiency. There is air conditioning pre-installed, electric shutters, under floor heating in the bathrooms and built in wardrobes. 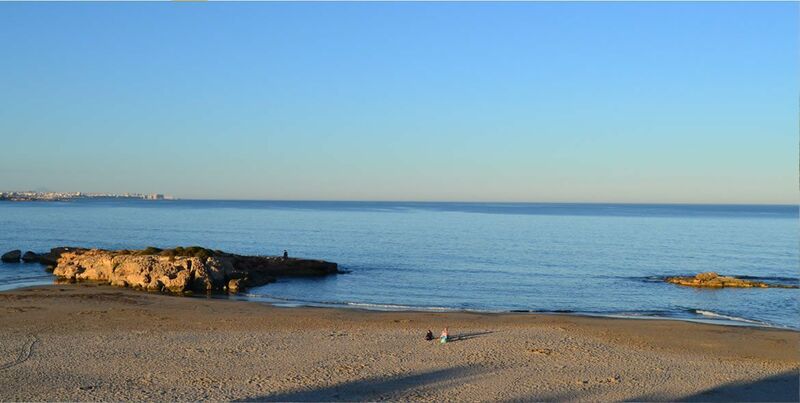 Torre de la Horadada is located south of Alicante in a beautiful location on the coast. There are lots of restaurants, bars and shops, also water sports, diving and snorkelling. It is well connected just 15 minutes from San Javier airport and 40 minutes from Alicante airport, with large commercial shopping centres and multiple golf courses all within easy reach. The road network in the area is also excellent with the N332 and AP7 motorway close by. These lovely townhouses have three bedrooms and two bathrooms. The ground floor comprises of an open plan kitchen with a dining room, a living room that overlooks the large terrace via large sliding doors, a bedroom and a bathroom. The first floor has two further bedrooms and a bathroom. Both bedrooms have their own terrace. The top floor has a solarium with lovely views to the surrounding area. All properties are built with high quality materials and they all have off-road parking. Features included in these apartments are: a security armoured front door, double glazing, exterior light fittings, fitted wardrobes in the bedrooms, under floor heating in the bathrooms, motorized blinds in the living room, pre-installation for air conditioning, and a fitted kitchen which is equipped with ceramic hob, extractor, oven, fridge, dishwasher, microwave and washing machine. This project is located close to all amenities in the desirable area of Torre de la Horadada, only a 5 minutes’ walk to the town centre, beaches, marina and promenade. It is a 10 minute drive to the golf courses of Campoamor, Villamartin and Las Ramblas and 45 minutes to La Manga golf course. Well connected by the road network, Murcia airport is 15 minutes away and Alicante airport is 45 minutes away. 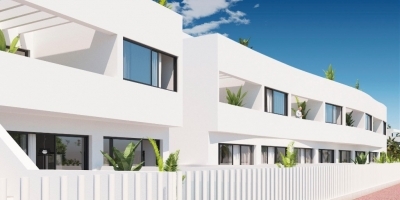 This new project of three modern townhouses with three bedrooms and three bathrooms is located in Torre de la Horadada, at 150 meters from the beach. They are built over three floors including the large private roof top solarium. They all have a private pool, a private garden and off road parking. These beautiful townhouses are built with excellent finishes and to a very high standard. The ground floor comprises of an American style kitchen, dining and living area, one bedroom and one bathroom. The first floor comprises of the large master bedroom with en-suite bathroom and direct access to a terrace, there is also another bedroom and bathroom. The top floor has the large roof solarium. This project is located close to all amenities in the desirable Torre de la Horadada, only a 5 minutes’ walk to the town centre, marina and promenade. The properties are a 10 minute drive to the golf courses of Campoamor, Villamartin and Las Ramblas and 45 minutes to La Manga golf course. Well connected by the road network, Murcia airport is 15 minutes away and Alicante airport is 45 minutes away. Stunning new project of twelve modern contemporary detached villas with three spacious bedrooms and three bathrooms, which are built over three floors including the large private roof top solarium. Each villa has its own private pool, a private garden and off road parking. These beautiful villas are built with excellent finishes and to a very high standard. The ground floor comprises of an American style kitchen, dining and living area, one bedroom and one bathroom. The first floor comprises of the large master bedroom with en-suite bathroom and direct access to a terrace, there is also another bedroom and bathroom. The top floor has the large roof solarium. This project is located close to all amenities in the desirable Torre de la Horadada, only a 5 minutes’ walk to the town centre, marina and promenade. The beautiful beaches of Torre de la Horadada are only 600 meters away. The properties are a 10 minute drive to the golf courses of Campoamor, Villamartin and Las Ramblas and 45 minutes to La Manga golf course. Well connected by the road network, Murcia airport is 15 minutes away and Alicante airport is 45 minutes away. 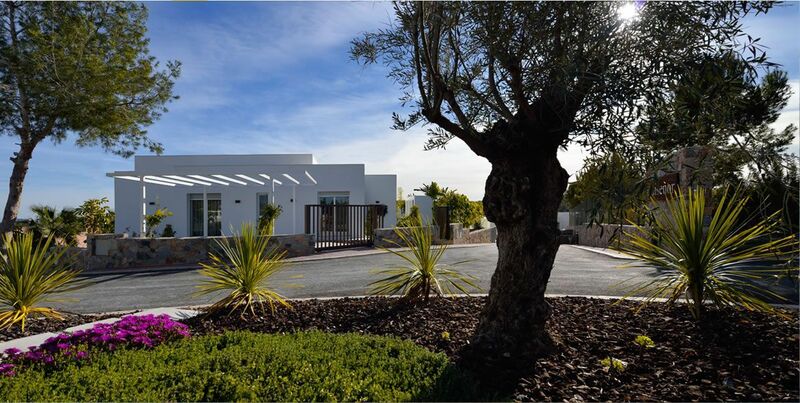 These beautiful detached villas are located in Torre de la Horadada, at just 300 meters from the beach. They are built over two floors with a private roof top solarium and have their own fully equipped garden area with a private swimming pool and a semi-basement for storage and laundry use. 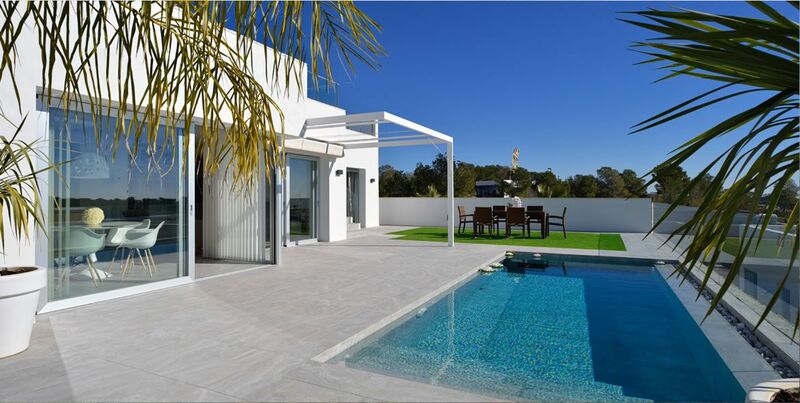 These villas are built on plots from 195m2 up to 230m2 and have 3 bedrooms and 3 bathrooms. 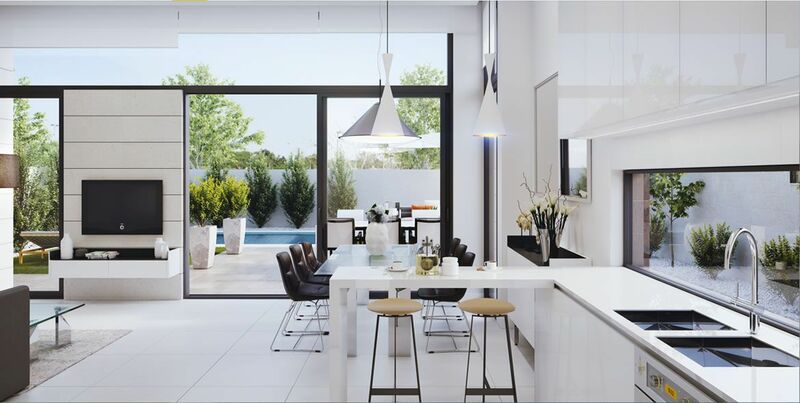 The ground floor consists of an open plan kitchen, a large living and dining area, which overlooks the pool area via large glass doors, a bedroom and a bathroom. The first floor has two more bedrooms, both with an en-suite bathroom. The master bedroom also has a dressing room and a large terrace overlooking the garden and the pool. The top floor is a solarium with a barbeque area and outdoor sink. These villas are built with superior quality. There is double glazing, a security front door, fitted wardrobes in the bedrooms, pre-installation for both air conditioning and water underfloor heating through the property. There is also a space to park your car within the plot. 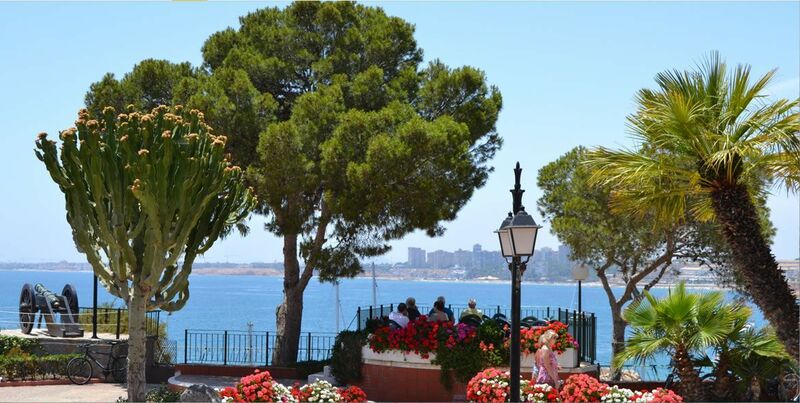 Torre de la Horadada is located south of Alicante on a beautiful location at the coast. It is one of the quietest areas in Pilar de la Horadada without any traffic or parking problems. There are lots of restaurants, bars and shops, 10 beaches, many of which are blue flag beaches, with fine sand to sunbathe or enjoy water activities. Within 20 minutes driving radius you can play golf in 12 different golf courses. Within a short drive you can find several shopping centres and it is only 15 minutes to Murcia airport and 45 minutes to Alicante airport. The buying and selling of housing will grow 12.5% this year, reaching 450,000 units. In 2016, new housing has been revalued by 3.7%. The recovery cycle, of the Spanish residential market is consolidating and will intensify throughout 2017. The evolution of the price of housing will continue with a gradual increase in average prices but with uneven progress in the different cities and coastal areas of Spain . The silhouette of the cranes is again shaped in many cities in Spain, especially in many areas of the Mediterranean coast, although the data is still very far from the statistics recorded during the boom of the mid-2000s. Experts agree in pointing out it is positive for a sustained recovery of the sector. During 2016, with data available up to October, the number of visas for construction of new housing in Spain increased to 53,131 units, up 33.23% over the same period in 2015, according to information provided by the Ministry of Promotion from the visas granted by the colleges of technical architects. This figure is already 6.91% higher than at the close of 2015 (49,695) and is the highest of the data for each year of the last five years. New housing developments are more secure. The construction of new promotions is mainly explained by the improvement of credit promoters, although under much stricter criteria than those of previous years. The bank limits this financing formula to those companies that already have their final land and is a project financially backed by the future owners, if not totally, at least for the most part. 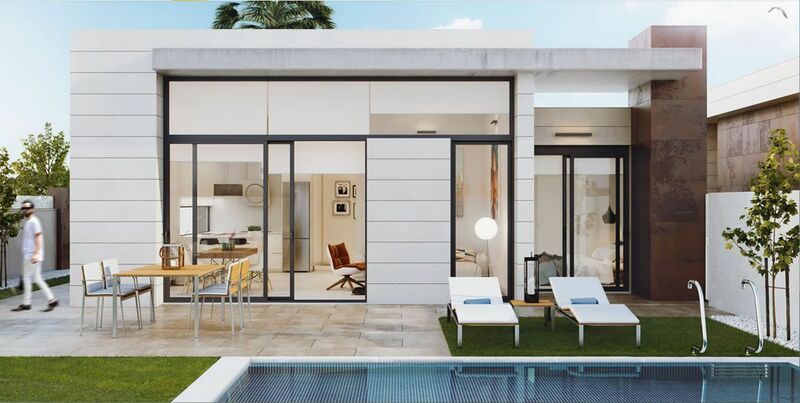 Do not hesitate to contact Golf Sun Spanish Properties if you are looking for new build properties in the area of Orihuela Costa, Costa Blanca or Costa Calida. In the catalogue of our website you can find all types of apartments, bungalows, houses, villas, luxury villas, land, fincas, etc ... both off plan and key ready. Contact us today and we will make an appointment to start fulfilling your dream of living near the Mediterranean.